The Selfie Project is a collaboration between RMIT media students as part of the CMWP course. The collaborators in this project were myself (Meg Mappin), Anna Jones and Carey Scheer. Having decided to work together on a project we brainstormed a range of topics (all of which were great ideas) and decided on a documentary project that explored the meaning behind the most wide-spread photographic trend of our time; the Selfie. The result is this short documentary Punching Life’s Clock. This project is based around social media and user-generated content, specifically the sharing of selfies on social media platforms such as Facebook. Our methodology was to first of all gather as many selfies as we could and then to interview some key selfie posters about their selfies. 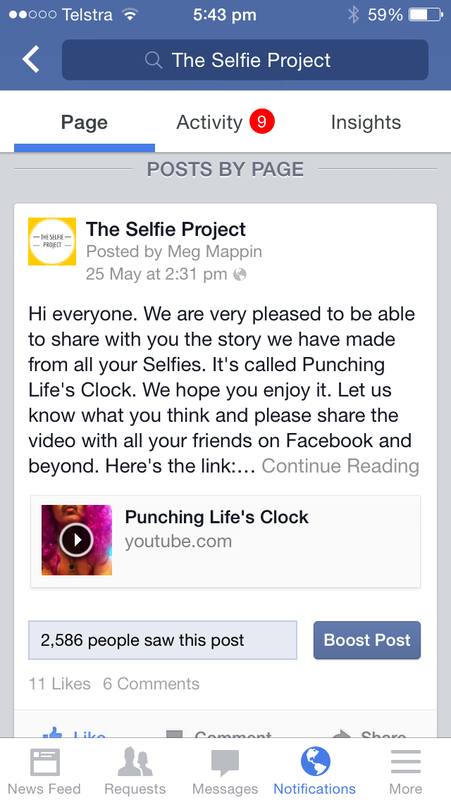 We used social media to source the content and to distribute the final product, a short documentary entitled Punching Life’s Clock. Although the project is in a sense stills-centric we have made this as a video so we can incorporate audio and moving image as well as still images. The flipped lecture provided useful material when considering the style and structure of this work. From the start Anna, Carey and I developed a positive and energetic collaborative approach, agreeing on tasks and sharing the workload. We brought different skills and strengths such as editing, audio recording, interviewing skills, marketing and promotions and these really enriched and enhanced the project. As an outcome of this project we intend to continue and extend our collaborations. To get the project moving we set up a Facebook page. The Selfie Project seeks to explore why we are so fascinated by seeing our own image. What is it we are trying to convey to the world when we share our selfie on a social media platform? What does the selfie really say about yourself? We also advertised on Gum Tree and on Sauce Bottle, however Facebook was certainly the most useful tool for gathering our selfies. We used Google docs to share information amongst the team. Early on we researched selfies and shared our findings. I set up a Google alert for ‘selfies’ and reported on findings from that in an early post in this blog. I also became a member of the Selfies Research Network a worldwide social media research group of over 1000 members who are exploring selfies. Joining this group gave me with really great insights, readings and conversations as well as another platform to distribute the documentary. Early on we prepared a schedule ensuring we had enough time to complete interviews and edit the project. By the end of data collection our Facebook page had 110 likes and 96 selfies. By mid April we had a large number of selfies posted on the Facebook site and decided on who we would interview. Each of us conducted one of the interviews. We chose three people who had posted very different selfies for very different reasons. One just loved to post selfies, another was posting selfies to reconstruct her social media persona after the end of a relationship and another posted selfies wearing masks and disguises to query the very idea of self and identity. A fourth interviewee was added. Carey came across a professional photographer from Boston, USA, Karl Baden who on Feb 23 1987 undertook a major photographic exercise. Karl decided to take a photograph of himself every day. Out of this came Every Day an ongoing visual document of Baden’s life. Carey arranged to interview Baden and gained his approval for us to use his photographs in our project. Baden’s thoughts on photographing himself and on selfies has added great depth to this project. I was the only member of the team with editing experience so I undertook the editor role. We met for two days and completed the bulk of the edit together. In between our meetings I added and sorted media to ensure that when we met we could make best use of the time. Again this was a great collaboration with each person bringing something fresh to the edit. In editing the project we have attempted to capture each of the interviewees thoughts on selfies and why they take them. As with many documentaries we knew what we wanted to explore but did not know what the outcome would be. Selfies are considered by many people to be indulgent and narcissistic. However what we found was far more than this through the interviews our documentary has become a very reflective piece on self, identity, happiness and mortality. We have used all the selfies uploaded to the Facebook page in the project. We have sourced additional material including a range of audio and hand-crafted text which Anna created using stop-motion and other techniques. The hand-crafted text supports the low-fi feel of the project based as it is on the smart phone selfies. We have considered adding a music track and have tried a number of different options including free-to-use audio from online sites and audio we recorded such as street sounds of cars to suggest time passing by. However we found that all these sounds interrupted the flow of the video and impacted on the interviews and have used a minimum of additional audio. From the start this has been a project based on social media and the use of different platforms to gather data and distribute the outcome. To profile the project on social media we have uploaded the documentary to YouTube and posted the link on The Selfie Project Facebook page so all the contributors can see the result. The YouTube video has to date had 358 views. We have asked everybody involved to share the documentary across their own social networks thus distributing the project beyond the original selfie contributors. We have posted on the Grad Dip Study Buddies page on Facebook. 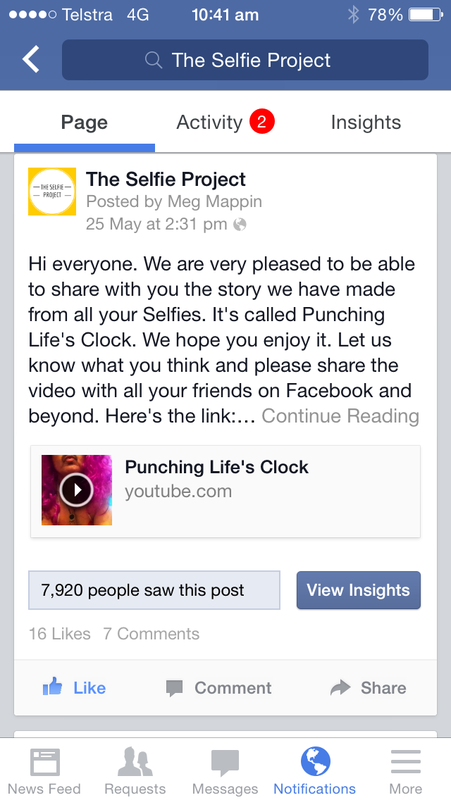 To further promote the project we have invested in a promoted post for the Selfie Project Facebook page. I also posted the project and YouTube link on the Selfies Research Network (with over 1000 members). The result of our initial Facebook strategies is that we reached had over 2500 people. The promoted post for our FaceBook page has now increased our reach to nearly 8,000. 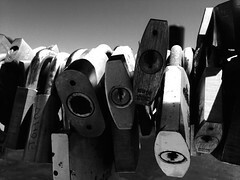 Karl Baden who Carey interviewed for the project has posted a link on my blog to his latest project. Other social media strategies we have employed is all of us posting on Twitter using appropriate hashtags. We have created a 15 second teaser video, and shared this on Instagram using hashtags ‘#selfie #documentary #RMIT’. We have also shared the post on the CMWP page of Linkedin and posted on our Flavours.me sites and our student blogs. Anna has recently joined the social media platform Pippit and will promote the video on that site. We have contacted the RMIT Facebook community and they have agreed to post the video on the Student News section of the RMIT website in July. Encouraged by James’s feedback on the draft of this video we plan to follow his suggestion and submit the documentary to relevant short film and mobile film festivals. Fantastic, Karl. Thanks for posting this and it’s great to see your latest work.